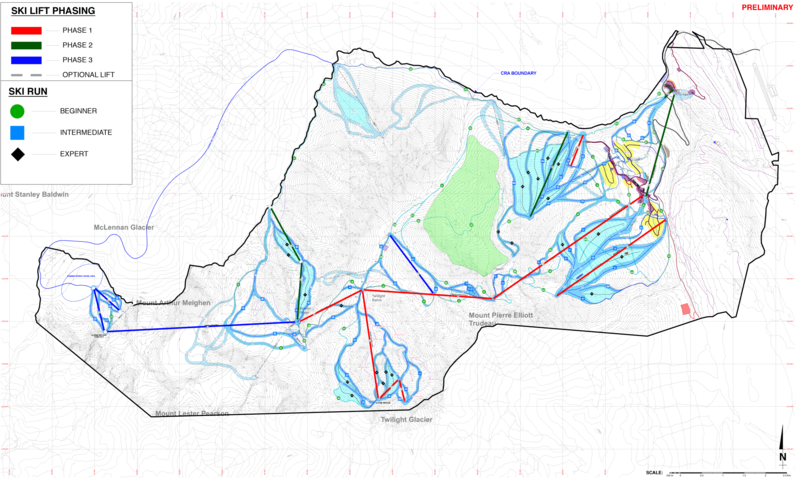 VANCOUVER – Valemount Glacier Destinations Ltd. (VGD) is pleased to announce that its consultants, the Pheidias Group and Oberti Resort Design have formally submitted the Master Plan for what will be the premier alpine sightseeing and skiing resort in North America and that the Province has accepted it. In an October 19, 2015 letter to the project’s planners, the Province indicated that the Master Plan meets its requirements for acceptance and it will initiate a Master Plan Review Process under the its All Seasons Resort Policy and Guidelines. The Mountain Resorts Branch of the Ministry of Forests, Lands and Natural Resource Operations of the Province of British Columbia will lead the process. A public Open House presenting the Master Plan will be held in Valemount on November 4th, 2015. “We are working diligently to build an unparalleled mountain destination in cooperation with the people of Valemount and the Simpcw First Nation,” said Oberto Oberti, the project’s designer and the President and CEO of VGD, “Our goal is to achieve a Master Development Agreement with the Province by the Spring of 2016.” Construction is expected to begin shortly thereafter. The Valemount Glacier Destination project will offer high alpine glacier sightseeing, year-round skiing and the largest vertical drop in North America by a wide margin. It is expected to attract destination visitors from around the world. For more information please contact Tommaso Oberti at toberti@pheidias.ca or (604) 662-8833.